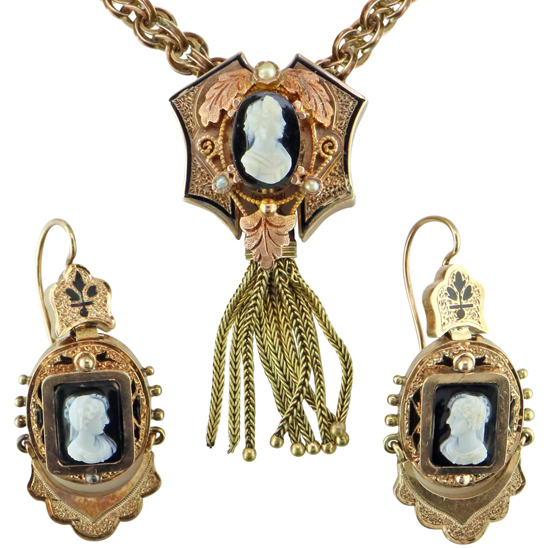 This wonderful set has all the features you'd want to see in Victorian jewelry. The necklace has a dramatic shape, the warm color of the 10K rose gold, a hardstone cameo, natural pearls, beautiful hand engraving with striking black enamel, and of course, the tassel. The earrings have matching agate cameos, properly facing left and right so they'll always be looking forward when worn. They are similarly decorated with crisp hand engraving and taille de epergne enamel, and each earring is hinged into 3 parts so they will swing freely. Taille de epergne is a type of champleve enamel where opaque enamels, usually black, are fired into engraved lines, often serving as an outline of the design. Hardstone cameos are most often carved from banded agate so that the carved figure is a light color that contrasts with the dark base layer. This set is black and white, others can be brown and white or orangy pink and white. Hardstone cameos are more expensive than cameos carved from shell because the carving is difficult and time consuming. As such, hardstone cameos are more rare than shell cameos and are very collectible.